For the last 18 years, backpacking has become a passion. I am a four-season backpacker and an off-trail navigator. Although I do take yearly trips to the American West or Southwest, the majority of my trips are in Michigan and Canada. My pack weight varies considerably but my base weight is below 18 lb (8 kg). I am primarily a tarp camper who averages more than 50 nights a year backpacking in a huge variety of weather conditions including relentless rain, wet snow and sub-zero temps. 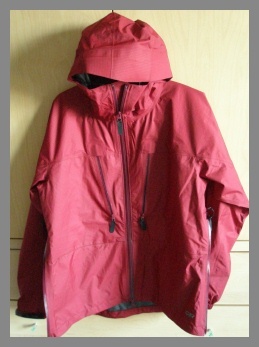 The Outdoor Research (OR) Celestial Jacket is one of several jackets featured in the Storm Shell category by the manufacturer. All jackets in that division are created with the use of waterproof but breathable fabrics. They also feature fully taped seams for protection from the elements. The Celestial Jacket is available in men's and women's sizes and a variety of colors. The jacket is not only lightweight, but it's highly compressible to reduce bulk when it is stowed. Features include 15 D Gore-Tex Paclite fabric, a dual-pull adjustable hood, a double separating front zipper with internal stormflap, a double-sliding TorsoFlo hem-to-pit side zippers, two zippered napoleon pockets, water resistant zippers, and adjustable cuffs and hem. Celestial Pants are also available from the manufacturer to make a complete storm outfit. The Outdoor Research Celestial Jacket arrived in great condition. All of the stitching, the taped seams and the zippers are finished with fine workmanship. I requested the women's version of the jacket in a size Large and in the color of Retro Red. I'm pleased with both the sizing and the color. Based on the size chart on the manufacturer's website, my body measurements were solidly between two sizes and actually closer to the smaller size (Medium). Because I prefer my outerwear to not have a close fit, I chose the larger size. The jacket actually fits perfectly as I can easily wear a few layers underneath it and not be restricted. In addition, it fits nicely and looks equally good without wearing extra layers of clothing. The Retro Red color of the jacket is a bit brighter than how it appears on the website but it's very close. The actual color is somewhere in between the manufacturer's website photo and the color in the report photos (that were taken by me). A couple of booklet-type hangtags were attached to the jacket when I received it. One referenced the qualities of the Gore-Tex Paclite material used to fabricate the jacket and the other stated the numerous features of the OR Women's Celestial Jacket. Paclite is the lightest of all waterproof fabrics that are manufactured by Gore-Tex. The Gore-Tex membrane is made out of an advanced composite of two different polymers. Water cannot penetrate from the outside but according to the manufacturer the vapor from perspiration can escape outwards. The breathable fabric has a slightly crisp feel to it and the fabric is supposed to stay waterproof even after extended use. Besides the waterproof nature of the fabric, all of the seams are sealed with GORE-SEAM tape and all five zippers sewn into the jacket are water-resistant and the edges of them are also taped. I am particularly excited about the inclusion of the double-sliding TorsoFlo side zips on the jacket. I have owned several jackets that have the standard pit-zips in various formats, but this is the first time that I have seen this venting option on a rain garment. Each zipper starts about 2 in (5 cm) below the underarm seam and ends at the bottom hem of the jacket. Each 14 in (35.5 cm) zipper can be opened from either end giving me a variety of options. Since my biggest problem with raingear has been the limited venting options on many jackets, I can't wait to actively use this feature. 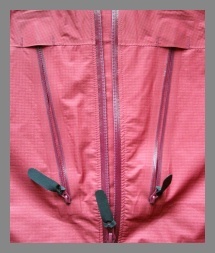 Each end of each zipper has a rubberized pull tag attached. All of the zippers on the jacket feature these non-slippery 1.75 in (4.5 cm) long tags. 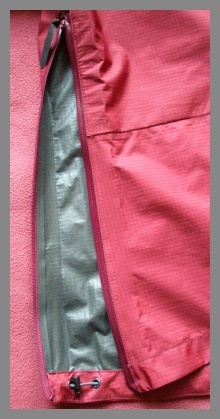 The center front of the jacket features a color-coordinated water-resistant zipper that is double separating. It's full length runs from the top of the tunnel neck of the jacket to the bottom hem. The napoleon pockets on the Celestial Jacket are both located on the chest area, one on either side of the center front zipper. The pockets are very roomy being 10.5 in (27 cm) square and they feature vertical 7.5 in (19 cm) zippers with storm flaps over the zipper pulls at the top ends. The pockets are backed with another layer of Paclite material. I will especially be looking at the accessibility of these pockets while wearing a pack. The sleeves are pieced and sewn in sort of "T" shape with a seam running across both sleeves and above the chest on the main section of the jacket. A similar arrangement forms the back of the jacket. The bottom edges of the sleeves feature partial encasement of elastic along half of their circumference. They can be tightened further with the use of a lightweight laminated hook and loop tab system on each sleeve. The body of the jacket is cut very generously and the bottom edge of the jacket is a full 48 in (122 cm) in circumference. The lower edge of the back of the jacket can be adjusted by moving the mini cordlock that is located on one end of an elastic drawcord. The cord is encased in the hem tunnel but it's threaded through grommets for accessibility. The back hem of the jacket is slightly longer in length to provide additional coverage. Although the hood of the jacket isn't huge, it still offers two adjustment features. The inside perimeter of the hood features an adjustable stretch cord encased in a fabric tunnel that has been inserted into the seam. The back of the hood has an adjustable toggle to shorten or lengthen the width of the hood but not the height. The hood features a small visor in the front. The interior of the jacket features a standard hang loop and washing instructions are located on a tag inserted into one of the side seams. The outside of the Retro Red-colored jacket is adorned with a few small gray-colored embroidered areas all which are located on the right side of the garment. They include a small manufacturer's logo (OR) on the lower edge of the jacket, a five-petal flower (designates a product designed for women by OR women) on the upper sleeve and the Gore-Tex PacLite logo above the sleeve edge. I am well acquainted with the qualities that make great rainwear. I have owned and used at least a score of rain garments throughout the years. Reliable amounts of precipitation are a given all months of the year in the environment where I backpack. Overall, I was immediately impressed with the Celestial Jacket. It has an amazing amount of features for its weight. I'm looking forward to the next several months of testing the jacket on many multi-day backpacking trips. During the field test period, I have worn the Outdoor Research Celestial Jacket during three multi-day backpacking trips. Total days in the field while backpacking amounted to twelve. In addition, the jacket was worn frequently for inclement weather trail runs and other outings (usually about 3 times a week). Locations ranged from and included conifer and deciduous forest communities with many rock outcroppings to sand dunes and swamps. Elevation ranged from 600 ft (183 m) to almost 2000 ft (610 m). During the field test period, I wore the Outdoor Research Celestial Jacket to not only serve as a rain jacket but to wear as a wind and cold weather shell. Most of my trips during this time period necessitated wearing a shell jacket both in the morning and the evening hours. I often found myself wearing the jacket to start a hike and it remained on for many hours until the temperature warmed up a bit. The jacket has functioned well or was very comfortable to wear during exertion while carrying a pack in temperatures well over 60 F (16 C). I didn't feel clammy or experience damp underlayers until the temperatures climbed higher or the humidity became higher. My underlayers consisted of either a light 100 wt fleece garment, a CoolMax shirt or another long sleeve garment. The jacket was easily layered over the choice of garment. After wearing the jacket the first few times, I soon became enamored with the TorsoFlow hem-to-pit side zip features of the jacket. Each 14 in (35.5 cm) zipper when opened allowed me to fasten the waist buckle of my backpack underneath the jacket and layer the front of the jacket over it. This flexibility not only allowed me extra ventilation, but I soon discovered a secondary perk. Because the front of the jacket was now unrestricted or free hanging, I didn't have to hassle with the restrictive nature of the backpack belt pulling on the jacket. Normally, I would've been tugging up on the front of my jacket so that it wouldn't bind the upper part of my body. In addition, this freedom allowed a better use of the Napoleon pockets over the chest area as they're not restricted by the belt. One of the pockets easily held my gloves and hat and there was additional storage in the other pocket for sunglasses and other items when needed. Initially, I thought it would bother me to have those pockets filled with gear as they are kind of in an awkward place as they lie right over the chest area. However, the pockets are very deep so the majority of whatever I put in them filters down to the bottom of the pocket which lies several inches above the waist. I haven't used the drawcord feature on the bottom hem yet. I prefer the extra venting capability when the bottom edge of the jacket isn't gathered. During the evening hours of each trip, the temperatures cooled immediately and I found myself wearing the jacket with several layers underneath. These included the long sleeve shirt that I wore while backpacking plus a light nylon single-jersey knit jacket and a light down jacket. I never felt like there was any constriction to my movement even with all of these layers underneath the Celestial Jacket. I have also worn the jacket as my jacket of choice for day outings including inclement weather trail runs. The jacket has functioned nicely in a couple hours of light rain. I didn't experience any wetness and the zips allowed for ventilation. After a dry start to the spring, there have been plenty of rainy episodes during which I could wear the jacket. On some days, the rain hasn't been of the all-day variety but has fallen in huge downpours lasting a half hour or so. The jacket has not been noticeably wet or has soaked through. The rain drops bead up quite effectively and when I remove the jacket, I just give the jacket a shake and most of the water falls off of it. When I became too warm during some of these activities, I vented the jacket with the TorsoFlo zippers. I have experienced a bit of light rain that entered through these openings but that was more due to a factor of the strong winds blowing the edges of the open zippers apart. The sleeve edges of the jacket while not being especially wide, can be pushed up to wear below the elbows. More importantly, the sleeves don't seem to ride up on their own while I was trekking with poles. Because wood ticks were a problem during many of my adventures, I often fastened the hook and tab on each sleeve edge to seal off the possibility of the ticks entering. I had much contact with vegetation on overgrown trails. The jacket's hood has worked well so far. The visor is very small on the hood, but I actually prefer that, as it doesn't restrict my vision. Because my hairstyle involves bangs they do get a little wet if I don't push them back with a bandanna or Buff (circular tube of CoolMax fabric). When I remove the jacket, it stows quite easily into the top pocket of my pack as it compresses to be quite compact. When the jacket is uncompressed, the PacLite fabric does show some soft wrinkles but these seem to disappear or are not really that noticeable. So far, the jacket has held up well. Although it was exposed to a lot of climbing over and around large blowdowns on one of my trips, it doesn't seem to have harmed it. All of the features of the jacket including multiple zippers, taped seams, and hood and sleeve adjustments are working fine. In the long term period, I will look at the overall durability of the jacket and its performance during additional rainy episodes. During the long term test period, I have worn the Outdoor Research Celestial Jacket during three more multi-day backpacking trips and additional dayhikes. Locations ranged from and included conifer and deciduous forest communities with many rock outcroppings to sand dunes and swamps and mountainous glacial terrain. Elevation ranged from 600 ft (183 m) to approximately 8000 ft (2400 m). I still love this jacket! During the long term testing period, the jacket was worn or carried on three additional backpacking trips in different capacities. The first trip in this period had several hours of moderate rain during one of the days. The jacket kept me dry and I really liked using the TorsoFlo side zips to ventilate the jacket and to layer the front of the jacket over the belt of my backpack. I continue to be impressed with the functionality of the TorsoFlo system. The second trip also had a few hours of rain but it was lighter in force. Again the jacket performed well and my clothes stayed dry. The third trip was mostly free of precipitation but it did rain several hours early one morning. Although I was sleeping during most of that time, I did go out into the rain as it was subsiding. The vegetation was wet so the jacket kept me from getting soaked during the cooler hours while making breakfast and breaking down camp. 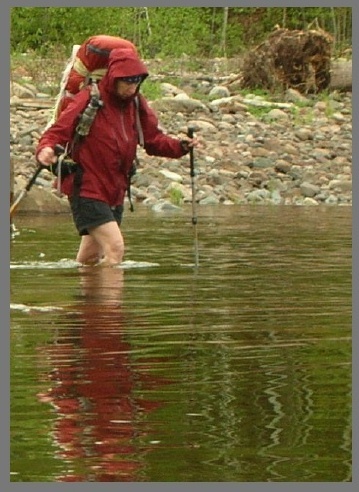 I have also continued to wear or carry the jacket during all dayhikes, bicycling and trail running. It is remarkably easy to stow when it's not needed. It easily fits into my small bike pack as well as daypacks. Most of the backpacking trips were in fairly warm weather during the daytime hours. However, on each day of every trip I wore the jacket for warmth and wind protection in both the early morning and evening hours. In fact, over half of the nights during the second and third trip I slept in the jacket as the nights were cooler than my sleeping bag was rated. I layered my clothing according to the degree of coldness I felt, but oftentimes I wore several layers underneath the jacket. Layers consisted of a sleeveless top, a long-sleeve light shirt and my light down jacket. The weather during the second trip was cool and windy enough that the jacket was worn constantly even while backpacking. If I could change anything about this jacket, I would remove the elastic that encases half of each circumference of the sleeve edges and instead close them with only the extended hook and loop tabs that are already in place. This would give the sleeves more versatility in layering over bulky layers. This is certainly a minor detail, but that feature would improve the already well-designed jacket. The jacket has held up beautifully throughout the test period. There really aren't any signs of wear on the Paclite material and the zippers all perform perfectly. The jacket has been repeatedly stuffed and unstuffed, sat on, slept in and its had contact with rough vegetation. It doesn't appear to have harmed it in any way. I only washed the jacket twice during the entire testing period. It really never appeared dirty or retained any odors but I thought it had enough use to merit a wash or two. I washed it in warm water and then tumbled dried it for ten minutes. This was plenty of time. Fabric softener was not used as suggested by the manufacturer. I assume that it would interfere with the waterproof nature of the materials. I will continue to wear the Women's Celestial Jacket for most of my outings as I know I can rely on it for waterproofness, comfort and ventilation. I will often combine it with the Women's Celestial Pants to make a complete rain outfit. This concludes my test series for the Women's Celestial Jacket. Thanks to Outdoor Research and BackpackGearTest for this neat opportunity to test the jacket.